This hearty 40-foot cruising boat from Germany is one in a family of boats recently introduced into the North American market by a revitalized Bavaria Yachts. It sits on a dividing line of sorts: its larger sisters, the Cruiser 45, 50 and 55, all carry twin rudders to help control their beamy hulls when well heeled in a breeze, while the 40 and the smaller 32 and 36 do not. Unlike its smaller sisters, the Cruiser 40 does boast twin steering stations in its cockpit. 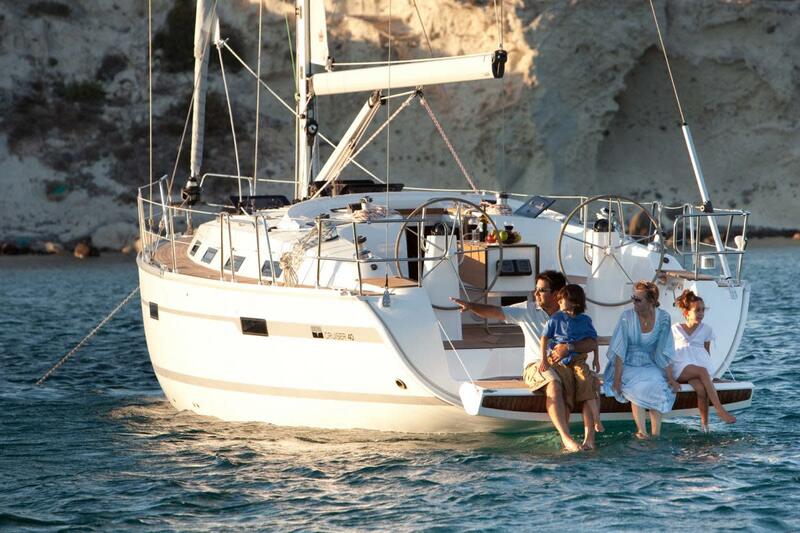 For a video of the Bavaria 40 and other Bavaria Cruisers in action, click here. Like all its siblings, the Cruiser 40 features a powerful high-volume hull and has a distinctive cabinhouse profile, with a unique concave vertical cabin side rising to a pronounced corner at the roof’s perimeter. On the smaller boats this combination of design elements can look a bit bulky, but the 40 is just big enough for the proportions to work well. The result is a very functional midsize mass-production cruising boat with a distinctive and attractive look to it. Construction details for the Cruiser 40 are similar to the other boats in this line. The hull is laid up by hand in Bavaria’s huge European production facility, with a mix of chopped-strand mat and and biaxial fabric set in isophthalic polyester resin. Boats exported to the United States also have an epoxy barrier coat for improved blister resistance. The hull, which is cored with Coremat below the waterline and with Airex foam above, is reinforced with a top-hat style internal grid. The deck is also cored with Airex and is screwed and bonded to the hull on a generous internal flange. The ballast keel is iron. The cockpit is both comfortable and functional, with long bench seats on either side, high coamings for back support and a fixed table with folding leaves amidships. The split twin-wheel helm allows easy access to the stern, where a large fold-down swim platform facilitates immediate access to the water. The transom is well engineered, with a clever hydraulic hinge that increases resistance as you drop the platform, so that it doesn’t fall flat all at once. The hinge also greatly reduces resistance when you’re hauling the platform back up, so that you need not strain yourself in the process. The mainsheet arrangement has two separate sheets that are set in a bridle and led forward along the boom, then back to coachroof winches on either side of the companionway. The twin sheets, matched with a powerful mechanical vang, should allow as much control over mainsail shape as a single sheet led to a traveler. The sheets for the blade jib, which sets forward of the wide swept-back spreaders on the mast, are led to winches mounted at the forward end of the cockpit coamings. No primary sail controls, therefore, can be reached by the helmsperson, though I expect the jibsheets could also be routed to the secondary winches farther aft. Moving forward you’ll find the deck is easy to negotiate, thanks to the aggressive antiskid. Deck cleats are numerous and well sized. The anchor rode locker at the bow is a bit unusual and may seem undersized if you want to carry a lot of chain. There is a small inspection hatch on deck, but physical access is through a gasketed hatch behind the forward bulkhead in the forward cabin below. The problem with this arrangement is that access to the locker through this hatch may be blocked off when there is too much chain stacked up inside. Our test boat had a three-cabin layout, with two staterooms aft under the cockpit and a large owner’s stateroom forward with an ensuite head. The galley is ranged Euro-style along the port side of the saloon, with another head aft to port. A two-cabin layout is also available, with a large storage area substituted for the aft stateroom on the port side. This version has a single head aft, but it is larger, with a separate shower stall. 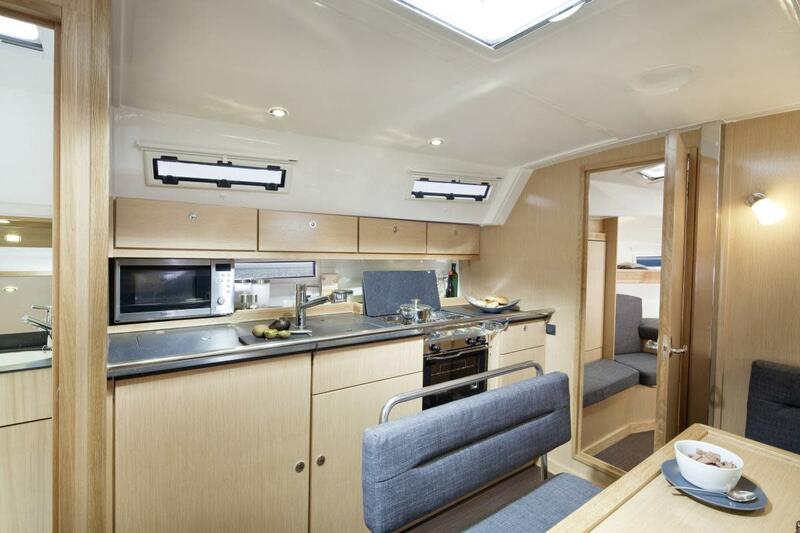 The aft cabins are well arranged, with a large dressing area, good stowage and a decent amount of vertical clearance over the double berth (which does unfortunately have a kink in its shoulder to accommodate the engine space). The dinette in the saloon, which can seat seven people easily, incorporates a settee that is also long enough to sleep the odd guest. Behind it is a dedicated nav station with a rather small desk, but enough space alongside to mount auxiliary electronics. Aesthetically, you can make of the interior what you want, as there are three different joinery woods to choose from (oak, mahogany and walnut) and a large selection of fabrics. Conditions during our test sail on Chesapeake Bay were unfortunately too light to tell us much about the boat. Sailing in just 4 to 6 knots of wind with nothing but the in-mast furling mainsail and the small jib forward, the most speed we were able to muster was 2 to 3 knots on a close reach. Based on my experience sailing the Cruiser 45, however, I expect this boat will also sail well in stronger breezes, though perhaps with more of a tendency to gripe when well heeled hard on the wind, due to the single rudder. During our sail, I found the helm response was crisp and accurate. Both steering stations had good ergonomics with excellent sightlines forward. Performance while motoring was good, and the boat had no trouble developing 6.7 knots of speed with the 40hp engine turning 2,200 rpm in flat water. At full throttle (2,850rpm) this climbed quickly to 7.7 knots. The boat’s turning radius at speed was reasonably tight, about 1 1/4 boatlengths, and she was easy to control while backing down. With its high-volume hull, large cockpit, spacious accommodations and variable interior aesthetic, the Cruiser 40 represents a good value for sailors looking for a family cruising boat in this highly competitive size range.